Do you have a formal art education or are you a self taught artist: I took one intro to Art class in college. They forced me to buy small highly detailed pens. I never took another class again, but was hooked for life. I’ve always been a student of creativity, and always will be. What is the medium in which you work: My heart belongs to pen and ink due its ability to obtain details i feel unlike any other medium. I also love oil painting and working with pencil. Pretty much whatever i can get my hands on at a particular time. But Pen and Ink is where my true skill and imagination is developed. What started you on your path as an artist: I probably started drawing in notebooks in 5th grade or earlier. Instead of taking notes, i liked to draw patterns, which soon turned into worlds and landscapes, which soon turned into the art you see on my site. It was also another way in order to tap into the creative spirit, one of the few forms i neglected until i was 20 years old. I used to build things before i was 10, out of wood, metal, constructs, erector sets, etc. Form 10-15 I handwrote and typed 3, 300+ page books. From 15 till the present, i have been in a band IREPRESS (http://www.myspace.com/irepress) and have written several albums as well as over 130 solo songs/creations/experiments. Then from 20 till the present I have been obsessed with visual arts in the hopes that I can one day represent some untouchable essence, or simply create something so visually stunning that it cannot be ignored by the often pretentious, ego filled, cliche driven world of Art. I have infinite patience, and enjoy creating in order to reach out towards infinity and someday touch it. What is one of the most important things that art has brought to your life: Patience, devotion, the unending search for knowledge, Passion, extreme positivity, but mainly Mystery. There is so much that remains unknown about the creative process, and the power of art in particular to heal, promote peace, and change things for the positive. I also feel the world of illusions is waiting for a breakthrough that links the illusory world of our realities with that of the visual world in such a way that knowledge of consciousness in general can take its next evolutionary step. 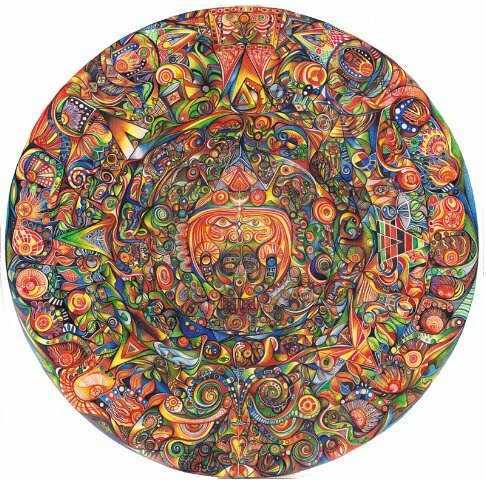 I am confident that the ancient peoples of tibet and the Americas, as well as the Mayans knew/discovered something truly beyond magic and mystery that is related to the art process of creation and particularly the mandala form which is seen throughout the Earths history and the known Universe. I dedicate my visual art life to uncovering these truths and mysteries. What is your favorite genre of art besides the one you work in: again im not educated in the world of Art, i simply draw. But i guess i could say Surrealism. I touch on that a bit, mostly in paintings, but also in all of my pen and ink works, the power of the subconscious works hand in hand with what i do, almost more so than my conscious states. Dreams are of the utmost importance, and i base many of waking actions on riddles that ive solved within my dreams. Do you have art showings, and if so what are they typically like: I often will go to Newbury Street and Peddle my art there. I have been in several cafes. I also sometimes sell my Art at my bands shows. I always offer my drawings with minimal profit to myself because money really isnt too important to me. However this also makes me stingy about selling originals. I would rather see millions of people buy drawings from me where i make 1 dollar per print, than sell one original which if i had to value, i would place at several millions of dollars. The amount of knowledge and insight i gain from an original drawing is priceless to me. I’m an unemployed former Art teacher and struggling arist and musician, yet I still would rather live like this than have to part with an original work that often takes me between 2 months to 2 years to complete. Do you have a certain set of clothes you make art in: anything from my boxers only to my winter clothes and hat. Most of my clothes are free, from various bands or friends who work at clothing companies. If i paint, i may wear something that i care even less about, but when pen and ink’ing, i wear whatever. Clothes are probably the least important factor of my life. I will never understand peoples fascinations with it and would rather spend my money on virtually anything else than on clothing. Id be happy in a hanes t shirt for the rest of my life. What has been the most frustrating part of being an artist? Trying to get the attention of someone who can help me take my art to the next level. I spent the majority of my life dealing with this aspect of the music industry, which i went to school for. The art world is totally different and often pathetically expensive in order to enter a competition or get known by anyone who supposedly has a pull in the industry. So i pretty much gave up trying, and am simply hoping that if i keep doing what im doing, leaning ever towards the creation of a truly undeniable piece of art. Which i hope will grab the attention of people. If not, id be perfectly happy with all the positive remarks i have gotten to date from various people worldwide. No matter what, i wont stop, whether im in a cave somewhere or in some NYC loft. What is your favorite sandwich of all time: Grilled Cheese. I just ate one and could already go for another. Has this year brought about any changes in your work, and if so what are they: Every day brings about a change in my work. But this year i have joined forces with the Cambridge Sunshine Foundation (www.treaty.tv) in order to help promote Native American awareness. I have always been fascinated with and studied the histories of these native peoples from the Maya to the Wampanoag, and so now i have a possible way to create a sustainable life for myself within this organization and this new goal of honoring these great peoples. As far as my work, i have seen even more sunrises, and am delving further into the separation of my body from whatevers inside during peak creative moments. I’m getting closer, so if i disappear one day, raid my room and spread my art everywhere. Who is your favorite artist alive or dead: Heironymous Bosch, Peter Bruegel the Elder, Hans Memling, Salvadore Dali, and Alex Grey… also Octavio Ocampo 🙂 cant list just one…. What is the most moving piece of artwork that you have seen in person: Probably either one of many salvador Dali pieces, or Alex Greys depiction of the Eightfold Path, his Gaia, or his Cosmic Christ. Do you have any animals, and what do they think of your work: My roomate has cats and he often sits near me while i create in the wee hours of the morning. He also often looks up while im viewing some of the spinning mandalas. I think he gets it, he’s like a buddah in a cat body. Do you have any upcoming exhibitions you would like to share with us: I wish, they are all pretty random when they happen. If anyone wants me for a show, or wants to buy anything, just email me and I’ll gladly accommodate..